Julia Gillard has failed for 18 years to give a legitimate reason why she never made a complaint to the police in relation to the AWU fraud committed by her and her previous boyfriend Bruce Wilson. She failed again at the Royal Commission on Wednesday (10-9-14) and should be charged immediately with concealing a serious indictable offence. Gillard does not dispute her involvement in the fraud but says she did not do it knowingly and was deceived by Bruce Wilson and when she found out what he was up to she broke off her relationship with him. So why did she not go to the police in 1995 when the fraud and theft were discovered. There is no legal privilege stopping her as she claims she was deceived when she helped Wilson commit crimes. In that situation the crime/fraud exception rule applies which extinguishes legal privilege. Why has she not gone to the police in the last 18 years? Why has she not gone to the Victoria police who are currently investigating the fraud and have been for over 12 months? The only support she is getting seems to be from other fraudsters and thieves in the union/Labor Party movement. No one else wants to go near her. Commissioner Dyson Heydon who is the one who writes the report would not have missed a beat and will do nothing more than embarrass himself if he does not come down hard on Gillard in his report. Every lawyer in the country who has followed the case knows she is at least guilty of the concealment of the fraud. Watch the news and you will see people being charged with concealing a crime or conspiring to conceal a crime on a regular basis. Gillard should not be given special treatment. I have raised the fact that Gillard has never gone to the police many times and so have others so it is not like Julia Gillard has not been put on notice. She has had 18 years and as a lawyer knows the law. There are a lot of witnesses that contradict Gillard on key evidence and many of them have no reason to give that evidence except that it is the truth. This site has covered the evidence many times (click here to read), but there is no real need. If Julia Gillard really knew she had done nothing illegal then she would have gone to the police long ago and made a full statement. She could do it today especially given they are currently investigating the fraud. The fact that she has not is a clear admission of guilt. So the next time someone wants to argue whether or not Julia Gillard is guilty of any crime, just raise the fact she has not gone to the police and made a complaint and therefore is guilty of the concealment of the fraud at the very least. That also points to her being guilty of other crimes such as the fraud itself. It must be remembered that Julia Gillard and her boss, Bernard Murphy, were sacked over the issue although she claims she resigned which is a lie and Murphy claims he resigned over another issue. They interviewed her and recorded the meeting and had a transcript. This is unheard of and the other lawyers were covering themselves. I managed to ask Bernard Murphy a few questions on Tuesday after he gave evidence at the Royal Commission as per the below video. Julia Gillard became Prime Minister on the 24th June 2010 after Kevin Rudd lost the support of the Labor Party. On the 21st August 2010 and Julia Gillard several weeks later formed a minority Government with the support of The Greens and 3 independents. There is a lot more evidence to come as the Royal Commission will be hearing from further witnesses in Melbourne next Monday regarding the AWU and then there is the continuing Victoria police investigation into the AWU fraud and the report from the Royal Commission due in December. So Ms Gillard is not in the clear yet. Julia Gillard was Prime Minister of Australia and any serious questions of wrong doing by any Prime Minister could and should be dealt with long before they become PM. Admin: The Melbourne trip I planned this week did not go ahead as the hearings turned out to be in Sydney. I will now likely go next week as the Royal Commission has confirmed the hearings are in Melbourne then. I’ve been following this with high interest and would have liked to have seen Julia Gillard charged with offences that were so obviously committed during her earlier years as solicitor. These are the ones we know of. Yes, she should be charged but that would be superfluous as she would never be convicted now she has given evidence at the Royal Commission. They will simply say she can never receive a fair trial as she has already given evidence in public during the RC. That’s why they have Royal Commissions, a total whitewash for the boys (all crooks) involved. SOB’s they are! This saga of the crooked Gillard has been going on so long I am glad I haven’t held my breath waiting for her to be charged with anything. It is a typical example of all the filth that goes on in the Australian establishment in all parties and all sections of government. everyone is fully aware of the criminal activities that Gillard has perpetrated along with most of her colleagues. Cover-ups (Shortens department) breaking WA law when she performed that dodgy legal work for the AWU under instructions from her lover Bruce Wilson, I wonder what they talked about in bed? how much union money they could swindle off the stupid union members. Look at the Slipper saga scandalous policy by Gillard just to keep her in power knowing she would not fool the electors a second time. Look at the Craig Thomson affair see supported him just because he was a crook like her, that will be interesting when he gets sentenced he will walk off with a suspended sentence and a bloody knighthood The mess she made of Australia is enough to warrant a jail sentence. Disgusted Australian from Myalup WA By the name of Allan Usherwood. I agree this whole matter needs to be thoroughly aired, as the RC is endeavouring to do. However, laying charges against Ms Gillard would prove pointless, as there’s very little evidence available in which to mount a successful prosecution. I really would have difficulty determining what charge(s) could be laid if evidence is available ? Though quite sympathetic to those who’d like to see evidence of criminality, the mantra in our legal system states – ‘He or accuses must prove’ and that proof must be beyond that of a reasonable doubt. Gillard of course admits to doing nothing wrong so that should be the end of the matter Hang -on !!! Craig Thompson ( who Gillard supported) said that he did nothing wrong !! And he is on his way to Prison !!!!! 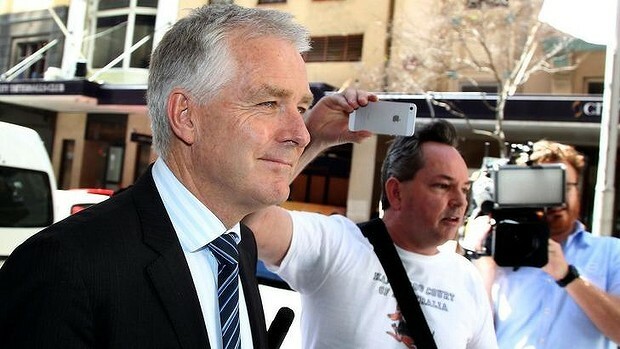 Shane ,I only heard a small part of Gillard’s evidence but in it she said she only gave legal advice. Did anyone ask her how her addressing the mining workers in a meeting at Boulder and convincing them to hand over their retirement fund money was giving legal advice ? All the reputable media reports, including Crikey.com must have been listening to a different commission. They quite forcefully suggest Julia HAS NO CASE TO ANSWER and it’s time all the wacko right-wingers in this country-and I’m now convinced you fit nicely into their cabal- should go get a life and leave the lady alone-she’s not for burning..
Reputable? Crikey? You are kidding right? Ha…the loony left still believes in the fairies….what a pitiful bunch !! Of course the Royal Commission has a lot more on her than we know, Surely Mr Stoljar and Justice Heydon were not fooled yesterday. She did not recall hmmm. She of course knows exactly what she has done. Of course Bruce paid for some of those renovations, I am sure bank-records still exist! Don’t forget, the Victorian Police are still investigating, they still have to wait for that privilege case of Bruce Wilson, that should be in court soon, I hope! I still have hope that she gets charged. I cannot see her going to jail with all the protection she has, but she will loose any respect, if she ever had any. She is a guilty as hell. Fancy having an affair and she never knew where all that money came from? Sure!. I have watched this whole sorry sager from the side lines, and I hate to say it, but I feel all the favours have been paid in full. No Case to Answer. But also no invitation to the next Christmas Party either . . Supporters of political criminals, who swear to uphold the law, and protect the citizens of Australia are perpetrators of the worst crimes imagineable, even stealing apples when in political office under The Crown. The first female PM of our great land and she was an utter disgrace. True Australians will never forgive her and that will haunt her forever. I venture to say, from here on, the majority of Aussies will be happy to live their lives never having to hear her name again. I agree with you wholeheartedly Shane that Julia Gillard must be charged with criminal/indictable offences by concealing the fraud and failing after 18 years still by not helping the police. It’s obvious that if Gillard goes to the police, she will fear that she will get charged. That is I believe the reason why she will not go to the police. The Victorian police have already believed that Gillard knowingly aided & abetted Bruce Wilson’s crimes. The Victorian police I think have a fair bit of evidence against her, & if the 360 documents do go to the Victorian police in a few weeks, well I think Gillard will be charged. Gillard didn’t go to the police in 1995/1996 because of the same reason she still hasn’t done now in 2014, because she will basically dob herself in, or more bluntly incriminate herself. Gillard is still saying deliberate lies, like the ones she said at the Royal Commission yesterday to make the Australian public believe that she did nothing wrong in the AWU fraud. Gillard’s lies about the AWU fraud have fooled the Australian public, but yesterday’s performance in the witness box shows that Gillard is a liar & is guilty as hell. Watching on TV I’m sure we all waited with interest to her response when asked her current occupation! I was waiting for her to say “Pensioner”! Labor are now gone from being a national party. The fact that those of presumed importance thought Ms Gillard as being the worthy one only goes to prove how uninformed these people are. Mr Shorten is gone so that leaves Mr Burke. Beg your pardon—–this person is a burke–so what is left? As Mr Christopher Pyne said in question time some weeks ago when looking at the Labor front bench————THIS IS JUST A TURKEY SHOOT. Fully agree with you Shane, Gillard should have been charged a long time ago for concealing an indictable offence. The link is actually for the “crime-fraud exception” which I update the link to go to that exact part. 36 years old and naive? Only a union supporter or Labor official would believe that garbage.